On March 4th of this year, Canada’s Prime Minister, Justin Trudeau, was welcomed as an honourary member of the Tsuut’ina Indian tribe of Alberta, and presented with a honourary headdress sealing the ceremony. As well, he was credited with an aboriginal name, “Gumistiyi”. Tribal spokesmen, Chief Roy Whitney, explained that the headdress, or “war bonnet”, symbolizes accomplishment, respect, bravery, and peace building. He referred to the golden eagle feathers, which made up the impressive bandore, as the “most sacred of all feathers” to First Nations peoples. This endowment was different than the one which took place in July of 2011, involving former Prime Minister Stephen Harper, on whom was bestowed the title of “Chief Speaker”, as he was declared to be an honourary chief of the Blood Tribe of Southern Alberta. They were not the first public figures to be feted in this manner. Prince Charles, Pierre Burton, and David Suzuki, as well as former Prime Ministers John Diefenbaker and Jean Chrétien, preceded the aforementioned heads of state. For a number of years, “Jolly Jack” Adams chose to hold the Detroit Red Wings training camp at Sault Ste. Marie, Michigan. The former star professional player, who became coach of the Motor City sextet in 1927 (and eventually General Manager), would not be a stranger to receiving honourary titles. His wife was from Napanee, Ontario, and he became known as the “Squire of Napanee”, due to the many favours rendered for his spouse’s home town. Two years running he took the Wings to the Eastern Ontario community, arranging for the NHL squad to face off against the local Comets. Individual players were welcomed into local schools, bringing smiles from the admiring children, as autographs were freely scribbled out for all comers. It earned the congenial NHL icon this appropriate tribute. In 1955 Lynn Patrick was a visitor to Humboldt, Saskatchewan, where he had taken in the final match of the Provincial Junior Hockey League. He was sponsor of the local club named the “Indians”, and he made a special presentation to Don Chiupka, the circuit’s scoring champion. On that same occasion the team reciprocated by declaring him “Chief of the Humboldt Indians”. Later that spring the great “Newsy” Lalonde was touted at Hogansburg, New York, where he was made honourary chief of the Mohawk-Iroquois Tribe. The Caughnawaga Indians endowed him with the title of “Chief Great Runner”. Colourfully attired in their full regalia, two Indian warriors, accompanied by four Indian princesses and two Indian boys from the St. Regis reservation, took part in the celebration. They began the proceedings by performing their welcome dance. Next, in the traditional manner, Riding Wolf and White Deer searched the crowd for the man they wished to honour, and escorted “Newsy” from the stands to the centre field of the Hogansburg stadium, where lacrosse (one of the sports in which Lalonde starred) was played. A ceremonial robe was placed upon his shoulders, and he knelt, Indian rattle in his hand, while the officiating tribe members sang their official chants to the beat of tom toms. At the close he was fitted with a colourful Indian headdress, and presented with the traditional pipe of peace. Across the border, in his home town of Cornwall, that Friday had been officially proclaimed as “Newsy” Lalonde Day! Freddie Sasakamoose was called the “reluctant Blackhawk”. The first Canadian Treaty Indian to make it to the NHL, his stay with Chicago was short-lived. It had nothing to do with his talent level, and everything to do with his wife’s aversion to the big city. Freddie was lonely without her in the Windy City, and, after 11 contests in the Big Time, he packed up and returned to Saskatchewan. 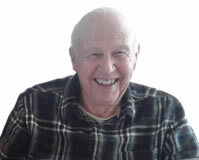 After completing the 1954-55 season with New Westminster of the WHL, and skating for Calgary of the same circuit the following year, he rounded out his shinny career with Kamloops Chiefs, a Senior level club. 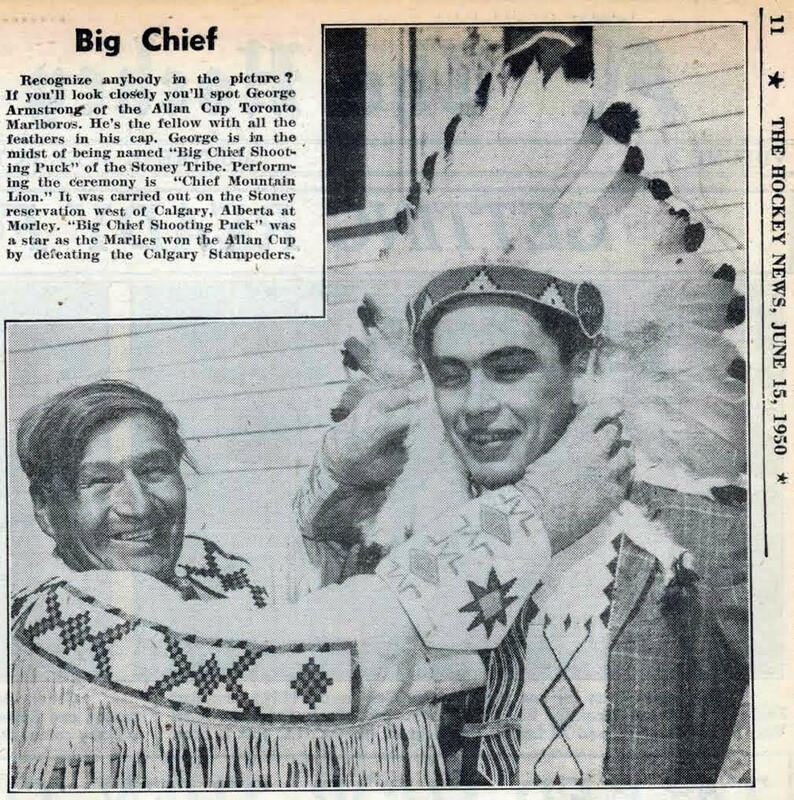 In 1957 the Kamloops Indian Reserve paid tribute to him by making him Honourary Chief of the Kamloops Reserve, with the title “Chief Thunderstick”, alluding to his famous slapshot. Twenty years later he was elected band chief, an actual C.E.O. position, of the Atahkakoop Reserve, a position he held for four years. In January of 1958, British Columbia celebrated its Centennial. As a part of that gala affair the city of Vancouver arranged an Old Timers hockey game. Upwards of 30 of the former greats of the game laced on their blades for a special exhibition tilt. Elmer Lach and Bryan Hextall led the “Whites” squad, while Neil Colville, who once starred with the Rangers, was in charge of the “Blues” contingent. The latter sextet was thrashed to the tune of 10-2. Maurice “Rocket” Richard was engaged to officiate the match. Previous to the opening face-off the Squamish Indian Reserve honoured him with the title “Chief Black Bear”. He donned a ceremonial headdress and continued to wear it as he refereed the game. In fact he never left the ice following the competition, continually circling the boards, graciously autographing programmes and hockey sticks. However, in 1962, he did agree to the endowment by the Montreal area band of that same tribe. He shared the moment with another Habitant icon, “Butch” Bouchard. For obvious reasons the former was dubbed “Big Chief Net Filler”. The tribe’s Chief Poking Fire then declared Bouchard to be “Big Chief Hive Filler”, referring to his off-season avocation as a beekeeper. While details are lacking, another Montreal rearguard, Dollard St. Laurent became “Chief Great Heart”. That same spring Bobby Hull became “Otistokowa” (Chief Great Star) as the Mohawk band from his home area of Belleville conducted a special ceremony in the Blackhawk dressing room. They presented him with feathered regalia to commemorate the occasion. Before it became “politically incorrect”, many NHL’ers with an Indian heritage were tagged as “Chief”. Jim Nielson, Ron Delorme, Gino Odjick, and Bobby Taylor are a few. Those monikers were unofficial. But the ten featured in this missive had it made “official”.